PLEASE READ MY DESCRIPTION BEFORE FOR BID ALSO YOU MUST AGREE TO MY POLICY . ALSO YOU MUST WAIT FOR INVOICE BEFORE PAY. ALL SHIPPING RATES LISTED BELOW . UP FOR AUCTION..IF YOU PAY BEFORE YOUR ITEM WILL BE CANCEL AND YOU WILL BE REFUNDED. 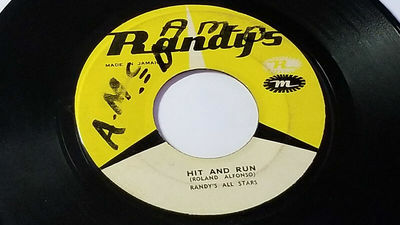 up for auction JAMAICAN pressing 1960's ROLANDO ALPHONSO " hit and run " b/w LORD CREATOR " man to man" labels has marker on both sides&sticker one one vinyl VG+ condition with few light marks on both sides but played ok. PLEASE NOTE SHIPPING COST IS LIABLE TO CHANGE WITHIN A YEAR BY CANADAPOST ON WHICH I HAVE NO CONTROL OF ALSO REGISTER &TRACKING AVAILABLE PLEASE CONTACT ME FOR DETAILS ALSO BUYERS IS HOLD RELIABLE FOR UNREGISTERED ITEMS. Shipping one LP Regular airmail =$20.00 to Japan,Brazil,Australia,Italy,Israel &other far Foreign Countries it Depends. Shipping 2 to 4 LP's Regular airmail .$38.34 Depends on the country please ask questions . shipping to Mexico,Brazil,Italy,France,japan &Europe also South America and Any Other Foreign Country then same Applied .if you have any questions please contact me for details. PLEASE NOTE - the weight for 5-8 7" = same shipping price as an LP or 12"
ALSO PLEASE NOTE SHIPPING COST LIABLE TO CHANGE WITHIN A YEAR PERIOD OF WHICH I HAVE NO CONTROL OF BY CANADAPOST.REGISTER&TRACKING IS AVAILABLE PLEASE CONTACT ME FOR DETAILS.BUYERS IS RESPONSIBLE FOR UNREGISTERED ITEM. the cost will be between $20.00 & $23.00 depending on the country where you lived.